Hardly a week goes by without hearing a story about someone who was mistreated at work by their employer. Likewise, it has become commonplace in some industries for employees to walk off the job and damage company property if they do not receive the pay and benefits that they demand. These, in addition to sensationalism of these incidents by the press, have led many to believe that employers and employees must fight for what they want. 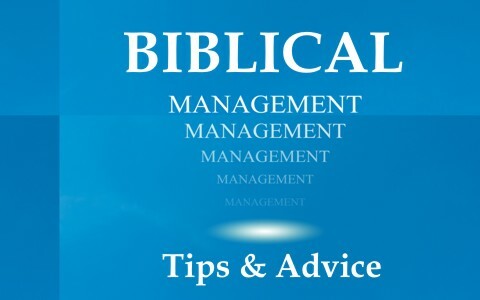 Although there are two sides to the stories, it is important for employers to seek Biblical tips and advice on how to manage employees. The first reference we see to work is found in Genesis 2:15 when God took Adam and put him in the Garden of Eden to dress it and keep it. Since sin had not entered the garden yet, Adam’s assignment was in keeping with God’s command to have dominion over the earth along with tending to the food supply that God had provided (Genesis 1:26-30). Later, after Adam and Eve had sinned, God cursed the ground so that it would no longer provide food without man having to work for it (Genesis 3:17-19). Later, Adam and Eve’s sons, Cain and Abel, brought offerings to the Lord. Cane’s offering was from the crops that he grew. Abel’s offering was a lamb from the sheep that he raised. God accepted Abel’s offering, but rejected Cain’s offering because it was not a blood sacrifice and it came from the work he had done with the earth, which was cursed. This made Cain angry and he killed his brother Abel. When this happened, God cursed Cain with no longer being able to grow crops for himself, which made it so that he had to do other types of work so he could pay someone to grow his food. This was the beginning of people hiring others to work and working for wages (Genesis 4:1-17). What is an employer’s responsibility to their employees? The first thing that an employer needs to do is establish a Christ-like work environment. We see this described in 1 Timothy 6:1-12. First, the employer must establish an environment of mutual respect (1 Timothy 6:1-2). This is done by establishing and promoting Godly work principles and ways of conducting business. It also involves praising those who demonstrate these Godly principles as well as letting people go who will not embrace this work ethic (1 Timothy 6:2-5). Overall, an employer should do whatever they can to make their employees successful. They should strive to inspire their employees to want to come to work because they want to be part of a team that works hard and does the right thing because it is the right and Godly thing to do. This means that employers must learn to motivate employees by inspiring them and not intimidating them (Ephesians 6:5-9). Next, an employer must promote godliness over personal profit (1 Timothy 6:6-8). This means that the employer should not take an unfair advantage of customers or their employees to make more money. This requires the employer to be content with what God has blessed them with. To do otherwise will lead them to do foolish and hurtful things to their employees, which will demonstrate a poor testimony of their salvation (1 Timothy 6:9-10). An employer must also pay fair wages and provide the benefits that they can afford to their employees. This includes paying their employees what they earned and doing it on time (Leviticus 19:13; Deuteronomy 24:14-15; Jeremiah 22:13; Malachi 3:5; Colossians 4:1). Finally and most importantly, the employer should seek to grow closer to Christ in their personal life. In doing so, their reputation as an employer and businessperson will open many doors to share Christ through their employees, their customers, and their colleagues in the community (1 Timothy 6:11-12). Working for others has been a practice that has been in effect since after the fall of man. The employer-employee relationship should be established on mutual respect. Employers should seek to establish a Christ like work environment that seeks the success of the employees as an important member of a Godly team. Employers should provide fair wages and benefits to their employees along with praise and rewards for doing what is right. Employers should ultimately see their position as one where they can have a great impact upon many people as a witness for Christ. Something else to read about work: What Does the Bible Say About Working?